1 Humans are not biologically sedentary, rather they are driven maintain near constant mobility during wakeful hours by an addictive hormonal systems (endorphins). Constant mobility maintains a euphoric state - a feeling well being and elevated pain thresholds. This satisfied intense nutritional needs and optimal reproductive behavior needed for species survival. It also delayed intellectual and technological development. 2 This euphoric existence associated with extreme levels of endorphins begins to end with civilizations. Protection from the elements and clothing allowed life with lower pain thresholds, and growing crops and animal husbandry allowed nutritional needs to be satisfied with less mobiity. This end of euphoria marked the commencement of a contemplative existence for the first time in human history. Written language and mathematics soon follow and with them rapid technological advancement. 3 The shoe sole is an interface between the plantar and support surfaces and inherent to its design. They attenuate mainly plantar shear but also vertical deformations which are adequate stimuli for plantar SA II mechanoreceptors. They also amplify frontal plane foot movement which creates sensory "noise" that results in instability that leads to amplified impact. Therefore, all footwear exact a health and mobility cost. Mobile humans suffer frequent injuries resulting from acute and chronic overloading of foot structures. Further, inadequate plantar load re-distribution caused by footwear results in plantar skin discomfort that humans avoid through becoming sedentary. Near universal shoe use by Renaissance Europeans explains why they were the first sedentary population. 4 Plantar sensory feedback provides humans with safe and efficient mobility when their bare feet are interacting with naturally deposited ground. This adaptation was the result of natural selection beginning with early bipedal hominids over millions of years, and humans for 250,000 years. 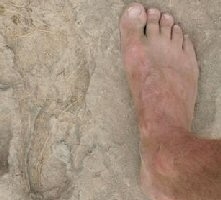 5 Footwear appear recently in the human story with civilizations. They were used by citizens in majority slave states as a status symbol - an expression of the ancient aesthetic tradition of body art through foot decoration. Social norms encouraged all social classes to wear shoes for the first time in Renaissance Europe, and worldwide through colonization and cultural imperialism. 6 Footwear use is the environmental constraint on weight-bearing that caused humans to become sedentary. They also caused lowered levels of endorphins than typical of humans previously. This has probably lead to psychological changes, such as a rise in anxiety, depressiveness, attenuated reproductive activity and lower pain thresholds typical of low endorphin existence. Freed of this hormonal drive to be mobile, humans became contemplative, which resulted in growing of crops, civilizations, written language and the beginning of technological advancement. 7 This helps to explain an array of presently poorly understood contemporary health issues. Mitigation of the health consequences of sedentary behavior can be better addressed through knowing its cause. Further, the recent origin of sedentary behavior indicates that humans are poorly adapted to maintaining the semi-recumbent posture intrinsic to a sedentary lifestyle. This may explain common problems of distal colon motility. For example the distal colon distention caused by inadequate gravitational aid to distal colon motility caused by the sedentary lifestyle may account for the present near universal symptoms of irritable bowel syndrome, diverticula formation and eventual diverticulitis. Further, this website identifies obesity as not inherent to humans, but rather a consequence of attenuated energy utilization from reduced weight-bearing time. 8 Gait disturbances caused by footwear are addressed in this website. Excessive stride length caused by footwear may for patellar tracking disorders such as patella dislocation, chondromalacia patella and patellofemoral pain disorder. Poor sensory feedback provided by footwear accounts for falls and ankle spraining. This website provides access to my original publications, and puts them into accessible form for both researchers and non-scientists. The ultimate goal of this website is to stimulate interest and thereby advance research in this area. Another objective is to encourage application of the principles presented here to primary prevention and injury treatment.